This is the blog of David M. Raab, marketing technology consultant and analyst. Mr. Raab is Principal at Raab Associates Inc. The blog is named for the Customer Experience Matrix, a tool to visualize marketing and operational interactions between a company and its customers. I reviewed Blueshift in June 2015, when the product had been in-market for just a few months and had a handful of large clients. Since then they’ve added many new features and grown to about 50 customers. So let’s do a quick update. As before, Blueshift can ingest, store and index pretty much any data with no advance modeling, using JSON, MongoDB, Postgres, and Kafka. Users do have to tell source systems what information to send and map inputs to standard entities such as customer name, product ID, or interaction type. There is some new advanced automation, such as tying related events to a transaction ID. The system’s ability to load and expose imported data in near-real-time remains impressive. Blueshift will stitch together customer identities using multiple identifiers and can convert anonymous to known profiles without losing any history. Profiles are automatically enhanced with product affinities and scores for purchase intent, engagement, and retention. The system had automated predictive modeling when I first reviewed it, but has now added machine- learning-based product recommendations. In fact, it recommendations are exceptionally sophisticated. Features include a wide range of rule- and model-based recommendation methods, an option for users to create custom recommendation types, and multi-product recommendation blocks that mix recommendations based on different rules. For example, the system can first pick a primary recommendation and then recommend products related to it. To check that the system is working as expected, users can preview recommendations for specified segments or individuals. The segment builder in Blueshift doesn’t seem to have changed much since my last review: users select data categories, elements, and values used to include or exclude segment members. The system still shows the counts for how many segment members are addressable via email, display ads, push, and SMS. 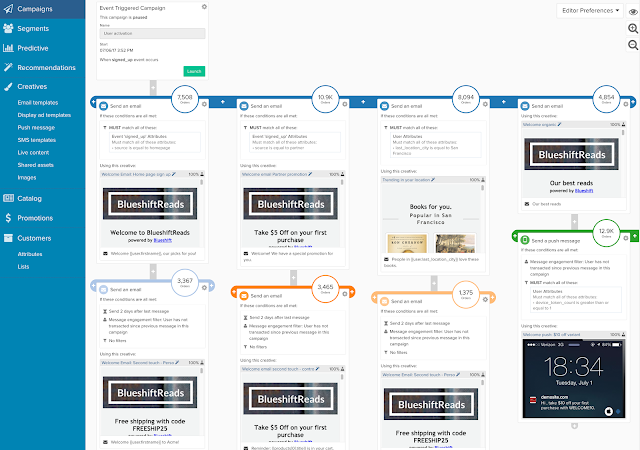 On the other hand, the campaign builder has expanded significantly. The previous form-based campaign builder has been replaced by a visual interface that allows branching sequences of events and different treatments within each event. These treatments include thumbnails of campaign creative and can be in different channels. That's special because many vendors still limit campaigns to a single channel. Campaigns can be triggered by events, run on fixed schedules, or executed once. Each treatment within an event has its own selection conditions, which can incorporate any data type: previous behaviors, model scores, preferred communications channels, and so on. Customers are tested against the treatment conditions in sequence and assigned to the first treatment they match. Content builders let users create templates for email, display ads, push messages, and SMS messages. This is another relatively rare feature. Templates can include personalized offers based on predictive models or recommendations. The system can run split tests of content or recommendation methods. Attribution reports can now include custom goals, which lets users measure different campaigns against different objectives. Blueshift still relies on external services to deliver the messages it creates. It has integrations with SendGrid, Sparkpost, and Cheetahmail for email and Twilio and Gupshup for SMS. Other channels can be fed through list extracts or custom API connectors. Blueshift still offers its product in three different versions: email-only, cross-channel and predictive. Pricing has increased since 2015, and now starts at $2,000 per month for the email edition version, $4,000 per month for the cross-channel edition and $10,000 per month for the predictive edition. Actual fees depend on the number of active customers, with the lowest tier starting at 500,000 active users per month. The company now has several enterprise-scale clients including LendingTree, Udacity, and Paypal. Customer Data Platform vendors come from many places, geographically and functionally. Lexer is unusual in both ways, having started in Australia as a social media listening platform. About two years ago the company refocused on building customer profiles with data from all sources. It quickly added clients among many of Australia’s largest consumer-facing brands including Qantas airlines and Westpac bank. Social media is still a major focus for Lexer. The system gathers data from Facebook and Instagram public pages and from the Twitter follower lists of clients’ brands. It analyzes posts and follows to understand consumer interests, assigning people to “tribes” such as “beach lifestyle” and personas such as “sports and fitness”. It supplements the social inputs with information from third party data sources, location history, and a clients’ own email, Web site, customer service, mobile apps, surveys, point of sale, and other systems. Matching is strictly deterministic, although links based on different matches can be chained together to unify identities across channels. The system can also use third party data to add connections it can’t be made directly. 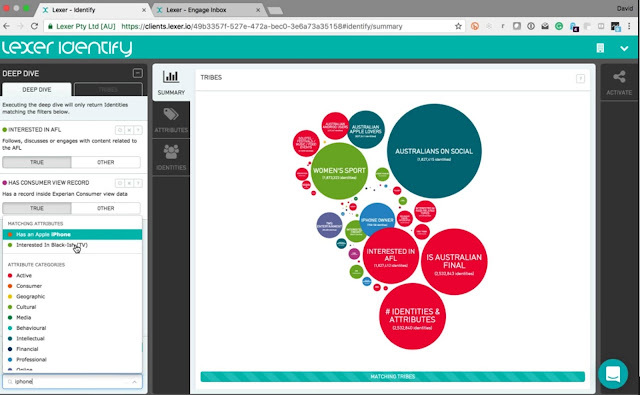 Lexer ingests data in near-real-time, making social media posts available to users within about five minutes. It can react to new data by moving customers into different tribes or personas and can send lists of those customers to external systems for targeting in social, email, or other channels. There are standard integrations with Facebook, Twitter, and Google Adwords advertising campaigns. External systems can also use an API to read the Lexer data, which is stored in Amazon Elastic Search. Unusally for a CDP, Lexer also provides a social engagement system that lets service agents engage directly with customers. This system displays the customer’s profile including a detailed interaction history and group memberships. Segment visualization is unusually colorful and attractive. Lexer has about forty clients, nearly all in Australia. It is just entering the U.S. market and hasn’t set U.S. prices. I’m still chewing over the role of “walled garden” vendors including Google, Amazon, and Facebook, and in particular how most observers – especially in the general media – fail to grasp how those firms differ from traditional monopolists. As it happens, I’m also preparing a speech for later this month that will touch on the topic, which means I’ve spent many hours working on slides to communicate the relevant concepts. Since just a handful of people will see the slides in person, I figured I’d share them here as well. In pondering the relation of the walled garden vendors to the rest of us, I’ve come to realize there are two primary dynamics at work. 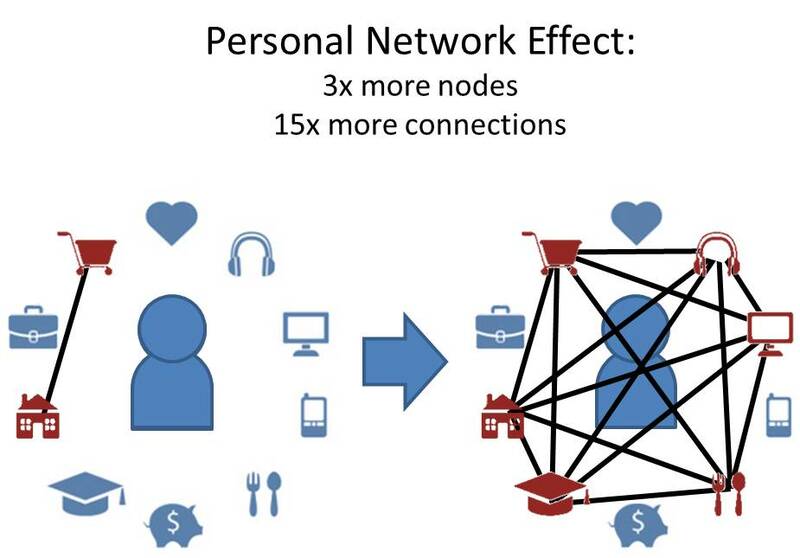 The first is the “personal network effect” that I’ve described previously. The fundamental notion is that companies get exponentially increasing value as they capture more types of information about a consumer. For example, it’s useful to know what’s on someone’s calendar and it’s useful to have a mapping app that captures their locations. But if the same company controls both those apps, it can connect them to provide a new service such as automatically mapping out the day’s travel route. Maybe you even add helpful suggestions for where to stop for fuel or lunch. In network terms, you can think of each application as a node with a value of its own and each connection between nodes having a separate additional value. 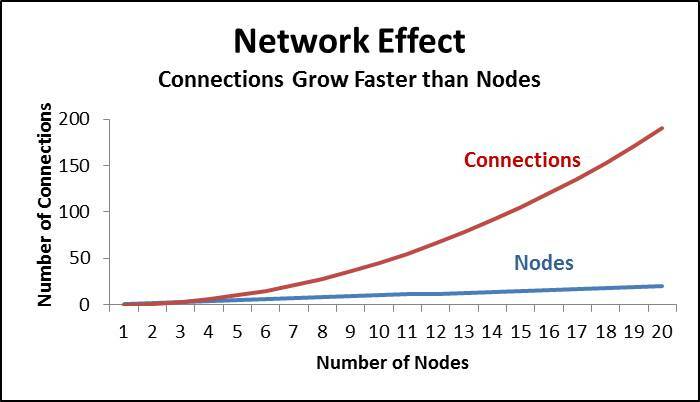 Since the number of connections increases faster than the number of nodes, there’s a sharp rise in value each time a new node is added. The more nodes you own already, the greater the increase: so companies that own several nodes can afford to pay more for a new node than companies that own just one node. This makes it tough for new companies to break into a customer’s life. It also makes it tough for customers to break away from their dominant network provider. My best visualization of this is to show the applications surrounding an individual and to draw lines showing how many more connections appear when you add nodes. If it looks like the customer is trapped by those lines, well, yes. In theory the consumer could switch to a new network. But switching costs are very high, since you have to train the new network to know as much about you as the old network. And switching to a new network just means you’re changing monopolists. Remember that the personal network effect makes it really inconvenient to have more than one primary network provider. The second dynamic is the competition among network providers to attract new customers. As with any network, personal networks hold a big first mover advantage: whichever provider first sells several apps to the same consumer has a good, and ever-growing, chance of becoming that consumer's primary network. Once the importance of this becomes clear, you can recognize the game of high-stakes leapfrog that network vendors have been playing for the past two decades. It starts with Amazon in 1994, intercepting buyers before they can reach a physical retailer. A few years later, Google starts catching buyers in the browser, making searches before they’re ready to buy through Amazon. Then Facebook shows up, first with a social network where people discuss their purchases before they make a Web search, and later with a mobile app that bypasses the Web browser altogether. A decade after that, Amazon strikes back with voice search on Alexa, which can happen even before someone types in a social post. Remember, this isn’t just about selling advertising. Vendors can share that pie. What they can’t share is control over one consumer’s personal network. Since that, in turn, gives control over actual purchases, it’s a much bigger prize and, therefore, worth a great deal more effort to win. Now you see why Amazon has put so much effort into hardware over the years. It's not just that Jeff Bezos likes cool gadgets. At this point, you might pause to wonder what happens next. Is there something that can intercept consumers before they say what they're thinking? AI- and/or implant-enabled mind reading are certainly possibilities. But the next frontier right now is subscriptions, which let purchases happen without any specific action for a voice system to intercept. This is exactly why subscriptions are getting so much attention right now. (I do need to admit that Dollar Shave Club, Blue Apron, and Birchbox messed up my chronology by launching around 2011, several years before Alexa). Of course, there’s nothing to prevent the network vendors from launching subscription services. In fact, the price of Blue Apron’s IPO was depressed precisely by the fear that Amazon would enter its business through the Whole Foods acquisition. But what’s really interesting about subscriptions is they’re less subject to the personal network effect than other types of purchases. A subscription company comes to understand its customers’ needs in one particular area very deeply. Potentially, it can fulfill those needs better than a company working from less detailed data gathered in other domains. Certainly a great deal depends on execution. But if I’ve trained my wine-by-mail company to understand my precise tastes, I’ll probably buy through them when I’m stocking up for my next party, even though Amazon knows I’m planning to have people over and has some general idea that my friends like to drink. In short, the walled gardens are not impregnable. Subscriptions might offer a way to help customers escape. But marketers are going to have to work harder than ever to create relationships strong enough to pull their customers away from the networks. All I can do here is to clarify the issues so marketers can better understand the tasks ahead. David Raab is consultant in marketing technology evaluation and analytics. He is Principal at Raab Associates Inc. and founder of the Customer Data Platform Institute. Mr. Raab has written hundreds of articles for industry publications. Many of these are available without charge at www.archive.raabassociatesinc.com Mr. Raab can be reached at draab@raabassociates.com.